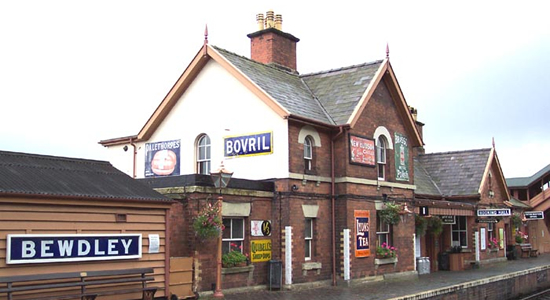 Originally the terminus of the Severn Valley Line, Bewdley station opened in 1862 and two years later became the junction terminus of the Tenbury & Bewdley Railway also. 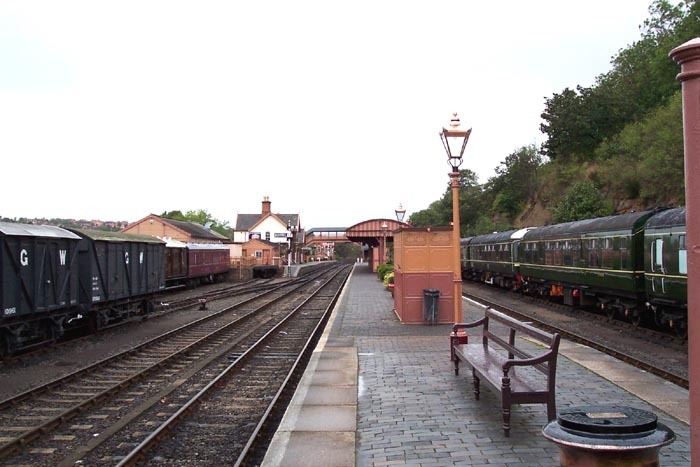 Following absorbtion by the GWR, 1870 saw the opening of an extension to the Severn Valley line to Kidderminster thus Bewdley lost its terminus status. 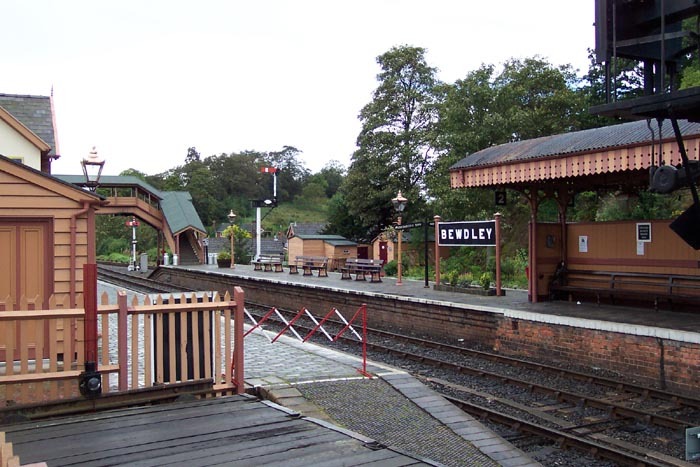 Finally closing to passenger traffic in 1970, it was not until 1974 that the Severn Valley Railway Society restored passenger services to Bewdley which, had once more, become a terminus for the line with the extention to Kidderminster not being reopened until 1984. Above we see the station from the island platform and what a welcome sight it is to see an original station building when compared with the architectural dross presented to us during the 1970-80s on such routes as the Cross-City. 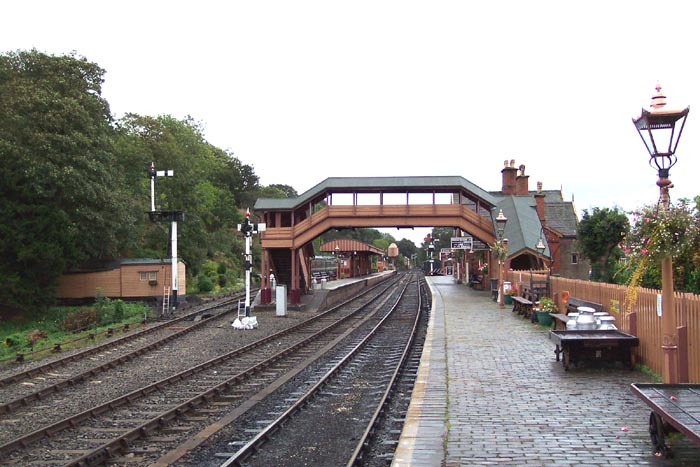 Above-left we have crossed to the platform housing the station building, which is to our left, and are looking across to the island platform and footbridge in the direction of Bridgnorth. The platform canopy is an original feature from the station's GWR days with its distinctive darted fringe around its base. Above-right we are looking in the same direction but this time have moved to the Kidderminster end of the island platform to get a perspective of the whole station site. The up and down lines can be seen immediately to the platform's left and to the left of them can be seen what were originally goods sidings but now appear to be used for housing a variety of wagons with the original goods shed just out of shot to the extreme left. The running line to the right of the shot housed a Heritage DMU on my visit, as can bee seen, and an ex-GWR Pannier Tank engine that can be seen on the Train Photos pages. 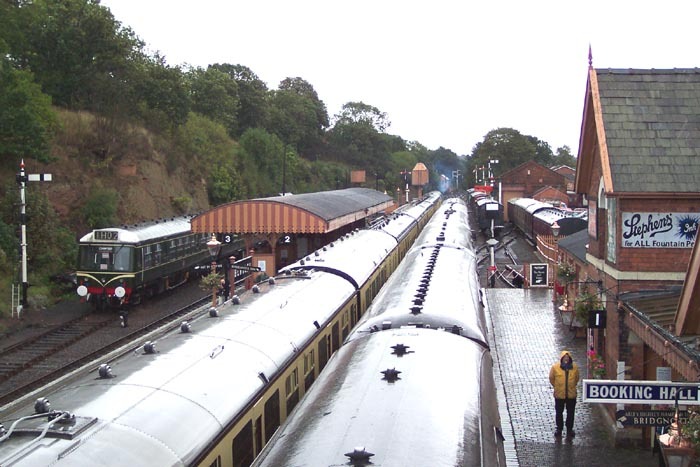 Above-left we are again looking towards Bridgnorth but this time from the top of the station footbridge. Ex-BR 48773 Stanier 8F 2-8-0 can be seen here beginning to get up steam to haul a privately hired train to Bridgnorth. 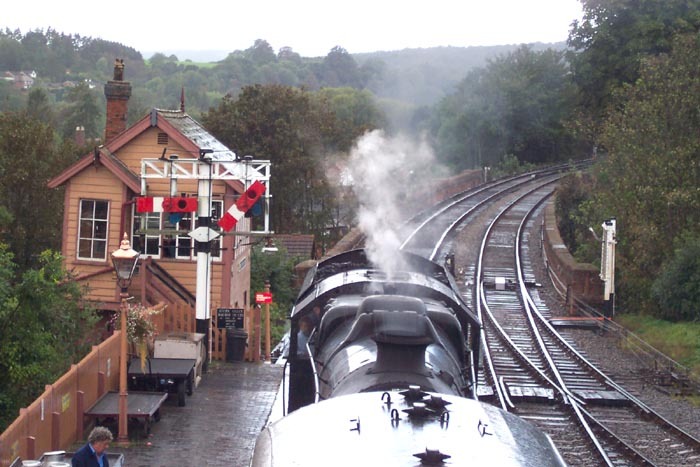 Above-right we can take a better look at Bewdley North signal box glimpsed in the previous shot and the semaphore signalling array. Above-left we are in the same spot as for the previous photograph but this time looking in the opposite direction along the platform towards Kidderminster. Interestingly, whilst the platform appears of considerable length, due to the barriers placed infront of the platform 'coffee-shop' to prevent accidents upon leaving (presumably to stop children running out of the door and off the side of the platform), the platform is no longer of significant length to accommodate the trains that serve it heading to Bridgnorth: only the first three carriages of each train can be used to alight/dismbark. Above-right we are once again on the footbridge looking in the same direction towards Kidderminster as both the up and down services pause at the station whilst on the far left, a Heritage DMU is sided. 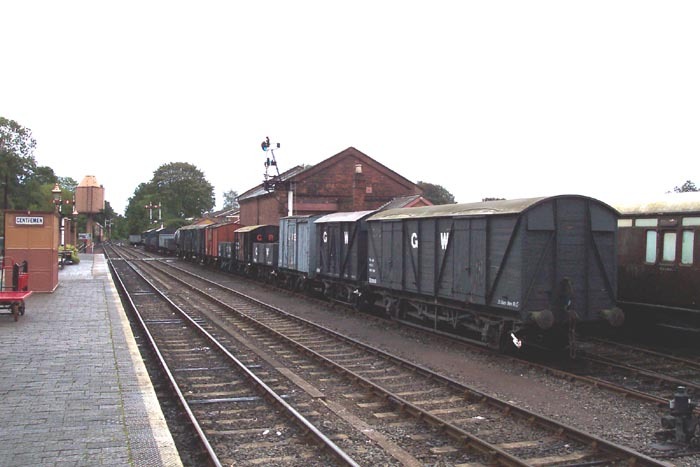 Above-left we have walked to the Kidderminster end of the island platform and can see a good array of goods wagons (in various states of repair) in sidings outside the original goods shed that can be seen ahead right. 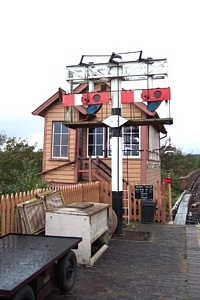 The water tower ahead on the island platform was not an original feature but is in keeping with the feel of the station. 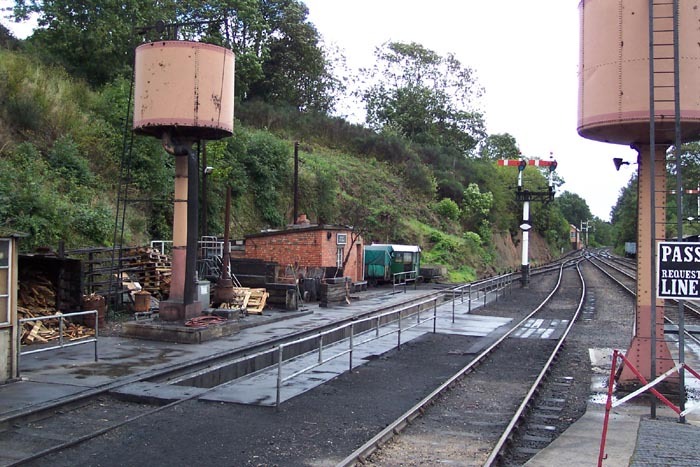 Above-right we have turned to our left from the previous shot and can see both water towers at the site, works hut, signal posts and in the distance Bewdley South signal box. This station is crammed with interesting features and well-worth a visit!